In-home Newborn Sessions are one of my most favorite sessions to photograph. I love capturing those early moments of an expanded family. The early days are a blur and having photographs of those tiny toes and sweet snuggles are precious. My newborn sessions are a natural event. I want to capture life as it happens with a newborn. This looks different is different homes, but generally I capture baby when she's awake, asleep, engaged, or just being a snuggly sleepy newborn. I prefer to meet the baby right where he or she is at that day. Often times my favorite moments are the in between shots, those are the sweetest even if there are tears (from baby or parents!). My newborn in-home sessions typically run anywhere from 1.5-2 hours depending on the mood of the baby. I like for the session to be relaxed and not rushed. However, if we need to move more quickly or if we get an amazing gallery done more quickly, then great! It's more about quality than quantity when it comes to time. It is nice to plan out some outfit options for the family before baby comes because after your bundle makes his or her appearance shopping or coordinating outfits can be a bit of a challenge ;). For newborn sessions, I recommend simple and neutral colors. My personal favorites are whites, creams, grays, blushes and other light tones the compliment baby's skin. It's important to remember or know that the postpartum body will be about what the body was like around month 6/7 (usually) and tender, so wearing loose fitting clothing such as dresses or flowy tops and elastic waist pants. For baby, less is more! 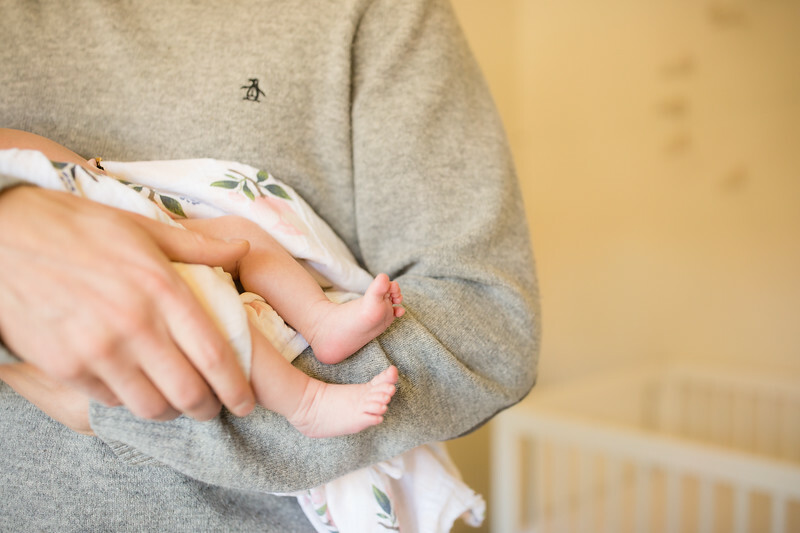 Simple swaddles, white diapers, or neutral clothing options look best on baby. One thing to keep in mind is that I am there to photograph, not judge the state of your home! I have two babes myself and know all too well that dishes will sit in the sink and laundry will pile up. So please do not clean your home before my arrival! We will be photographing in the living room, bedroom/nursery and we can do quick clean ups or push aside anything that is distracting in a shot. If you are breastfeeding, please feel free to nurse during the session. I am comfortable and happy to photograph those tender moments, or I can step outside of the room if needed. It's all about mom and dad feeling comfortable! If you are welcoming a sibling, yay! I love to capture the tender and chaotic moments that are all thing siblings! When a toddler enters the show, all bets are off as to what can happen, but those are some of the best moments of all! 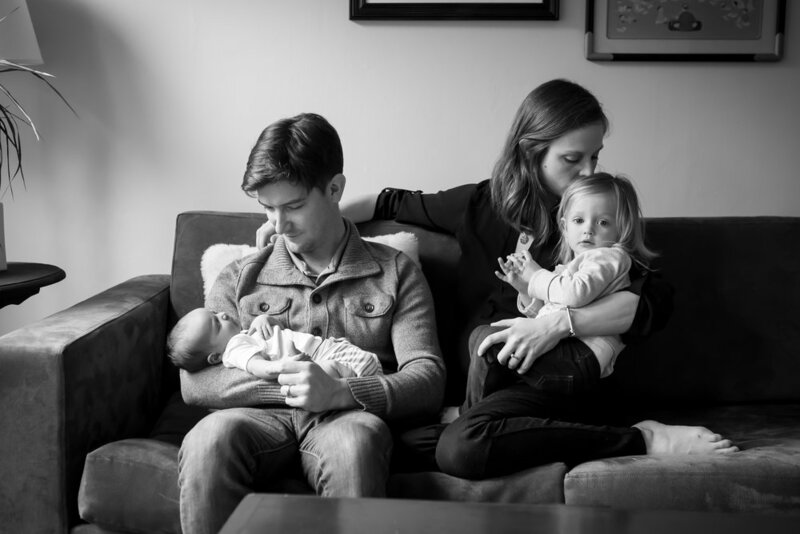 An In-Home Newborn Session takes place anywhere within the first 3 months after birth. Our photo session will last about 1.5-2 hours (sometimes slightly longer), giving us time to get to know one another (again, if we've worked together before), explore the space and photograph along the way. Your session will render many amazing images. During my editing process, I will select the best of the best and edit those for exposure and color. I will then deliver about 50 edited images to you via an online gallery. These hi-res images are yours to download and keep forever. I also offer detail editing, albums and canvases for an additional fee. Please contact for investment pricing.